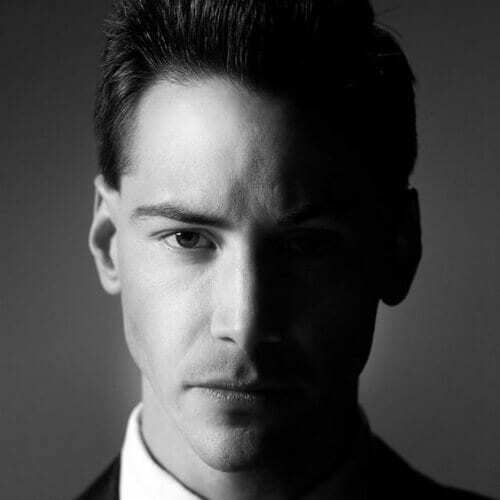 Keanu Reeves is undoubtedly one of most handsome actors Hollywood has ever seen. Throughout his career, he has been in roughly 95 movies and TV shows and he has had almost as many looks to go with the very interesting plethora of characters he has chosen to portray over the years. 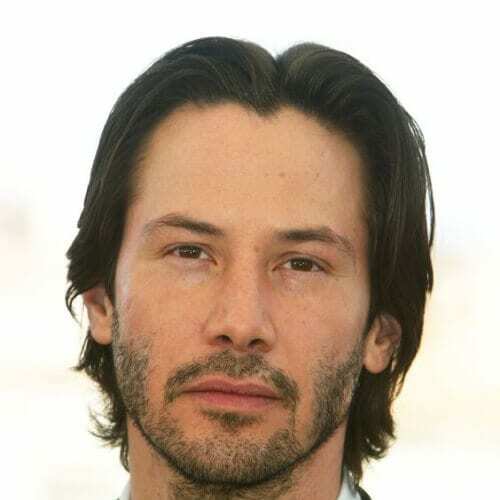 However, the most iconic Keanu Reeves hair design is still his everyday one, a medium shaggy hairstyle which you will find featured in this article along with all his other ones. 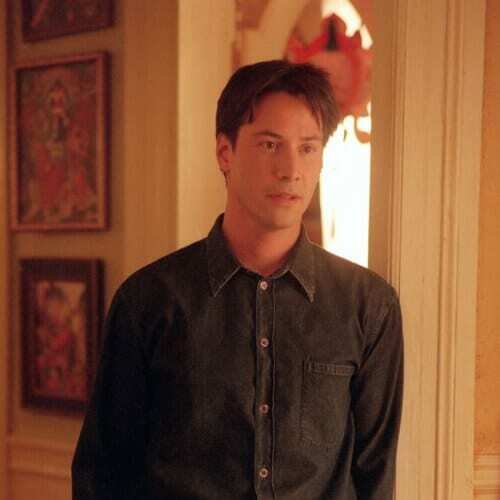 Let’s start off with a casual look that Keanu used to wear in his thirties. 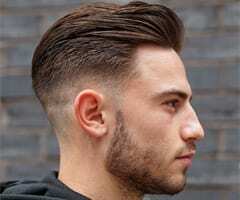 It’s a very simple and short haircut that has been styled with a bit of hair wax or hair gel. This means that you can easily replicate it yourself at home. 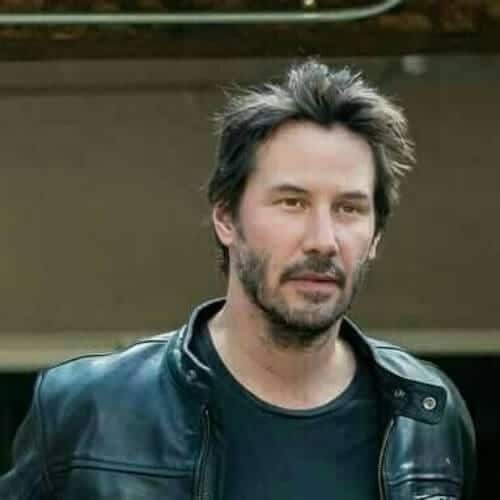 Even though he sometimes cuts his hair shorter, be it for a movie or for personal reasons, Keanu always goes for the same type of messy hairstyle. It’s the one that represents him and suits his personality best. 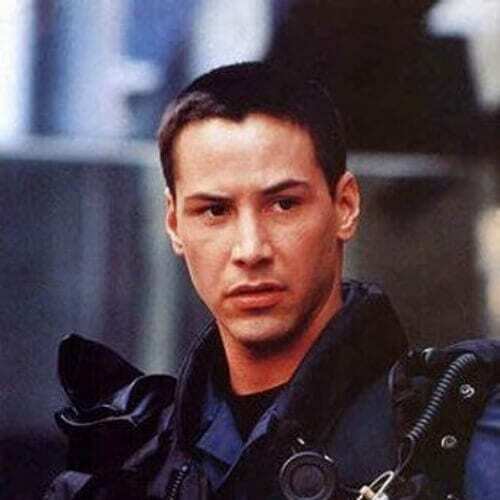 Having starred in many action movies and played several police officers or army men himself, Keanu is no stranger to the buzz cut, a hairstyle that originated in the army. It’s simple and serviceable, and it requires extremely low maintenance on your part. 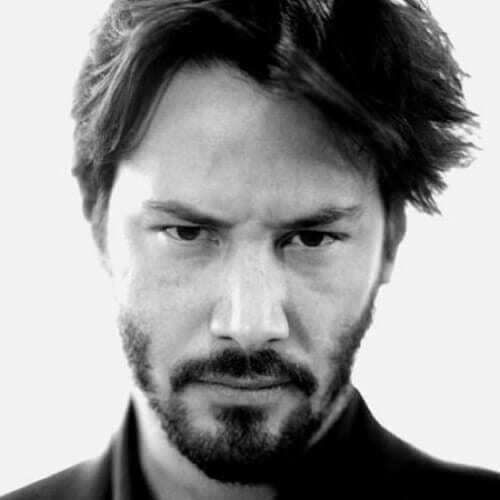 Did you know that Keanu Reeves was born in Beirut, Lebanon? That’s where his mother was working at the time. 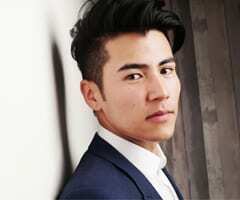 However, he grew up in Canada until he was able to obtain a green card and move to America. 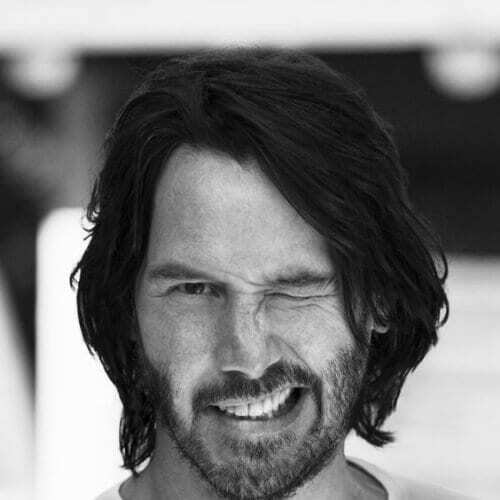 And speaking of Keanu’s growing up and ancestry, he is actually half American and half British, his mother being from England. The actor stated in an interview that his mother’s English customs and mannerisms have stayed with him all his life. 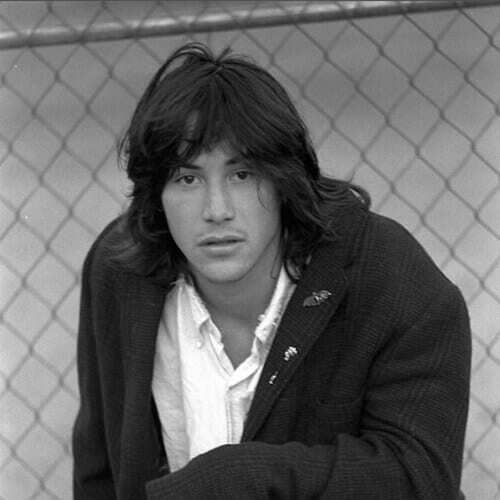 Keanu also tried bangs at some point during his lengthy career. It might not have been his best styling choice, but it still is one worth mentioning. This is a short crop with a set of asymmetrical and boyish bangs. 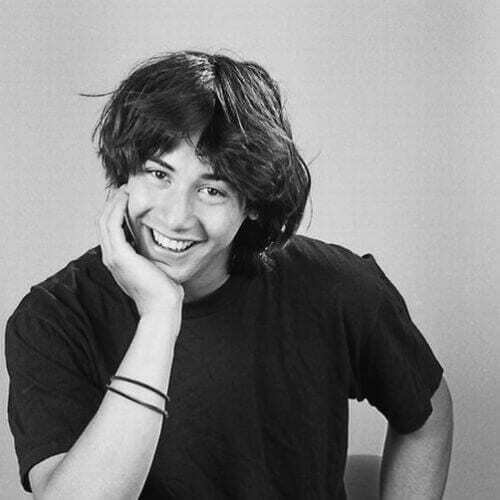 When he was in one of the four high schools he attended, Keanu excelled at ice hockey as a goalie, earning the nickname ‘The Wall.’ We can only imagine that this is what a teenage boy Keanu Reeves would have looked like hair-wise. 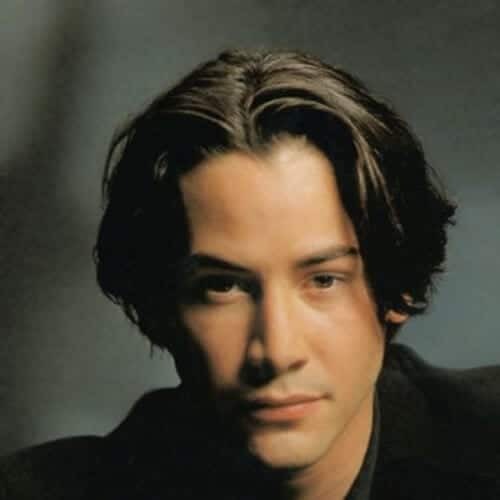 This is the hairstyle that we most associate with the actor Keanu Reeves. He has worn it for most of his lifetime and has now become iconic. It’s a shaggy and airy medium cut that was made famous during the 90s. Here is a perfect example of a layered haircut and how you can wear one in your mature years in case you don’t want to cut all your locks off. Notice how there is no perfect part down the middle, which only adds to the rough charm of this hairstyle. 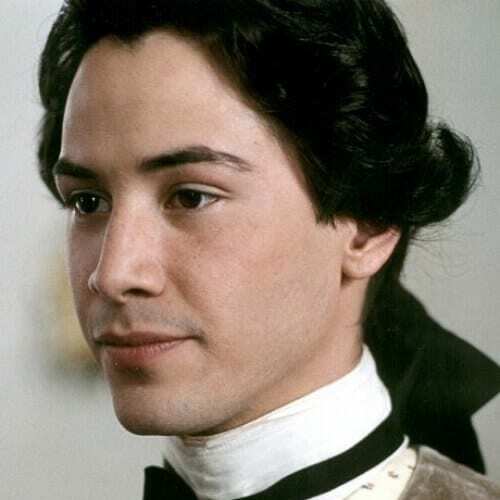 Keanu’s acting career began at the tender age of nine. He was cast in a theatre production of the famous Damn Yankees. He took a break until he was fifteen when he played Mercutio in, what else, Romeo and Juliet. 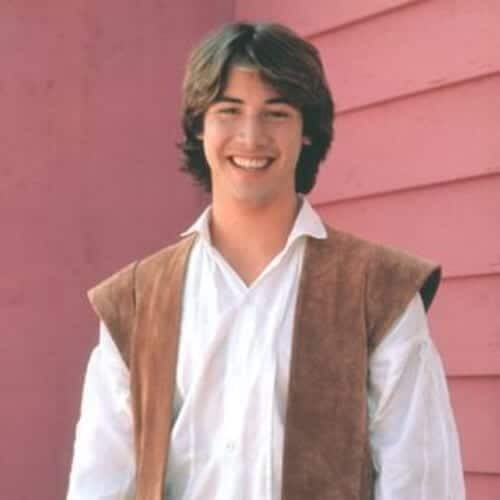 However, Keanu’s debut on screen came later, when he appeared in one of the episodes of Hangin’ In. 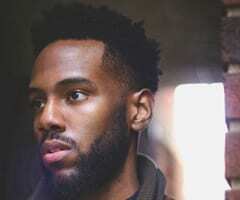 This choppy short haircut is perfect in case you want to grow a beard. 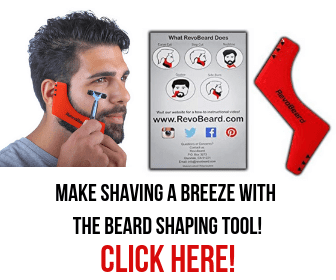 It’s the perfect rugged addition to a well-groomed beard because it will make you look both elegant and devil-may-care at the same time. 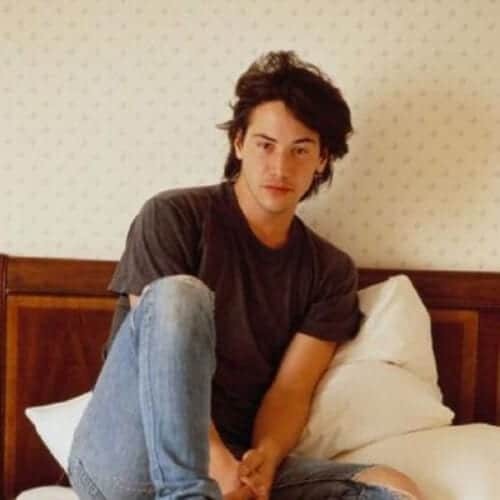 If you need some inspiration for your morning Instagram pics, Keanu Reeves can definitely help you there. Here’s a perfect example of how you should do bed head or the ‘I woke up like this look’ with minimal effort but maximum results. Here’s another throwback to the 90s for you. Do you remember back in the day when everyone used to wear spikes in every way possible? 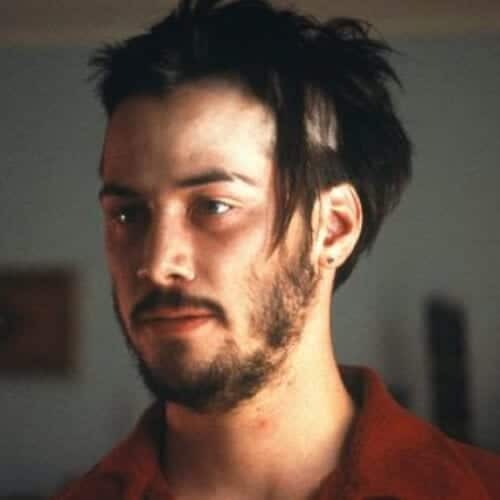 Just in case that hair trend ever comes back, here’s a picture of the gorgeous Keanu Reeves to show you how it used to be done. We’ve got another one for you because the 90s were a big decade for men’s hair. We bet you either remember this one or recognize it from movies and TV shows if you’re too young to actually remember it yourself. It’s the most iconic look of the 90s for men. 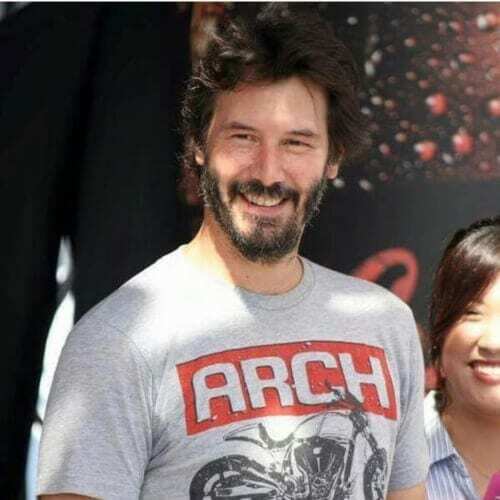 Here is proof that actor Keanu Reeves is so handsome that he can pull off any look he sets his mind too. This picture is part of a photo shoot, but we have to say that the styling here is impeccable and is giving us major hair envy. From one wet look to another. 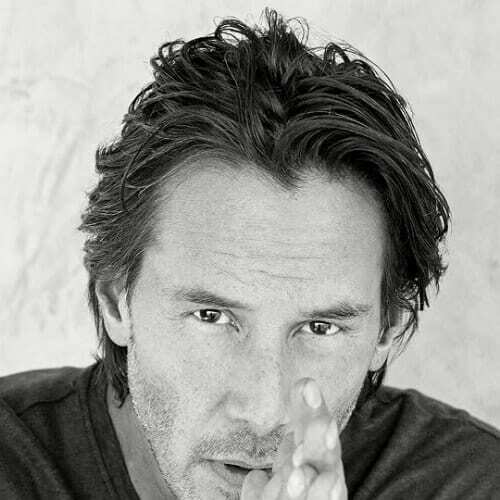 Yes, luckily for everyone, Keanu did another similar photoshoot some years later. However, you can notice that the styling is somewhat different because we have to keep in tune with the trends. 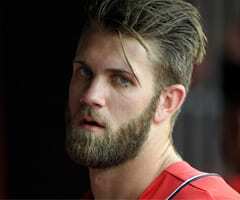 This is a slick back accompanied by a beard. It just so seems that nothing makes this actor feel better in his skin than medium or long hair. He started wearing it as a teenager and has never looked back since. It is truly an expression of his artistic self as well as his rebellious persona. 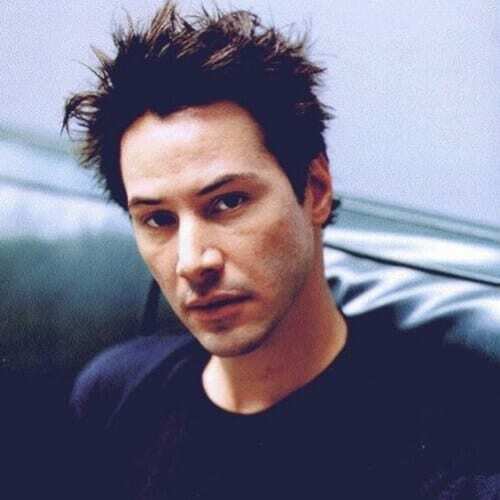 Starting with the year 1991, Keanu became a bass player for the band Dogstar which mainly plays grunge, proving that not only can he act, but he can also sing. The band was successful worldwide, released albums, and had many tours around the world. Unfortunately, the members disbanded in 2002. The middle part is one of the easiest solutions when you have medium hair. To make sure your locks stay in place you can use some hair gel, hair wax or a bit of hairspray for a finishing touch. A five o’clock shadow will add a bit of roughness to your look. 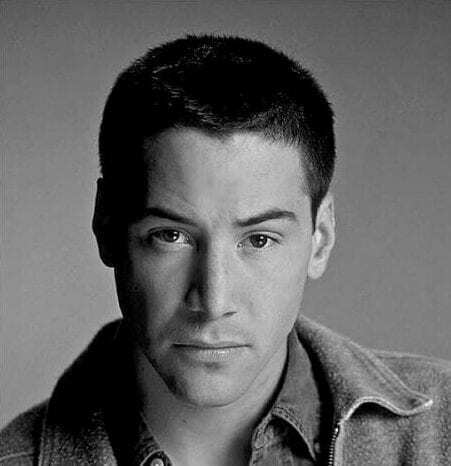 When he was young and still trying to make it big in Hollywood, Keanu starred in a number of commercials for everyday products, including one for Coca Cola. You know what they say – there are no small parts. 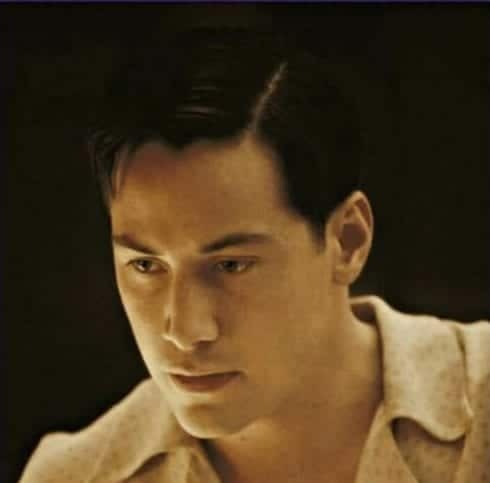 Although he was a worldwide successful musician as well and had big dreams of becoming a famous hockey player, Keanu Reeves is, above all, an actor. Therefore, let’s now take a look at his career throughout the years and all the different hairstyles he has worn. 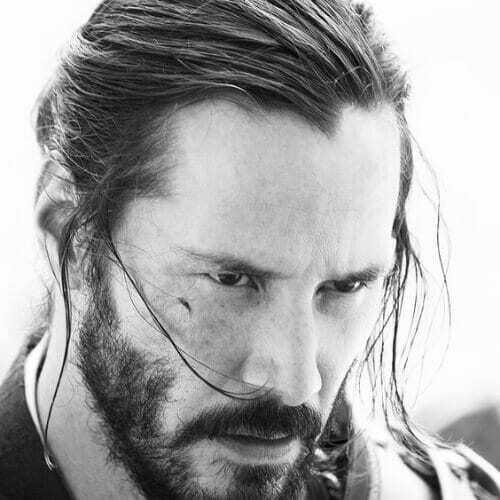 In 47 Ronin, Keanu played Kai, a samurai who’s on a mission to avenge his master. Therefore, his hairstyle was meant to represent exactly that. It’s a medium cut with a samurai bun at the back and a few loose strands in the front. 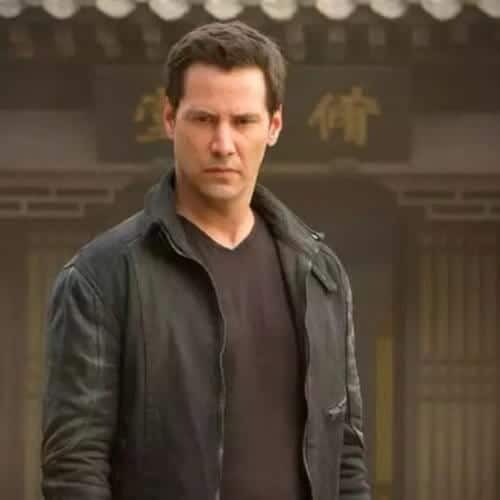 As Donaka Mark in The Man of Tai Chi, Keanu didn’t go for the Asian look anymore. Instead, he simply sported a casual yet handsome short haircut that you can easily ask your stylist to give you the next you visit him or her. This movies with an all-star cast was a remake after the 1951 original. 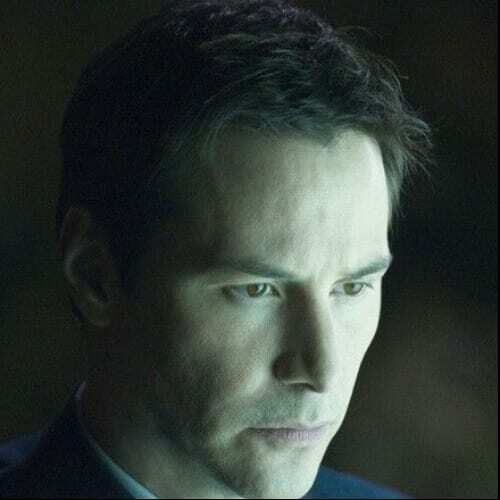 Keanu plays Klaatu, an alien that visits the earth allegedly to save it. What haircut does an alien have you ask? If he’s as handsome as Keanu Reeves, any haircut he wants! 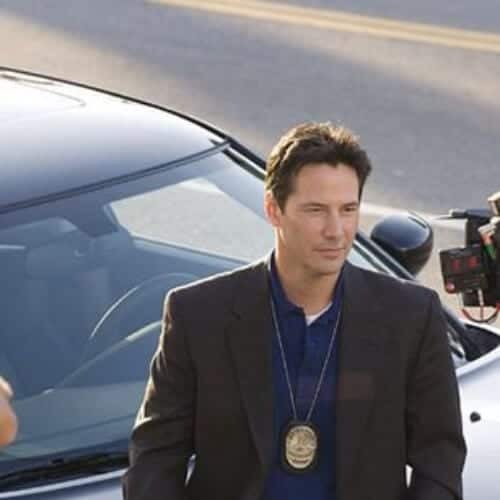 You cannot go wrong if you cast Keanu Reeves as a police officer, a detective or a man trying to revenge someone’s death. Most of his career is based on this type of role and he certainly has both the face and the hair to pull it off. Here is the softer side of Keanu in a still of him and sweetheart Sandra Bullock from the movie The Lake House. 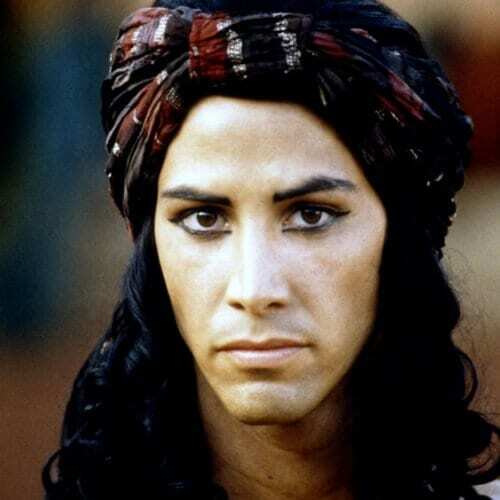 For this role, Keanu sported an artistic and bohemian medium haircut that really accentuated his romantic features. 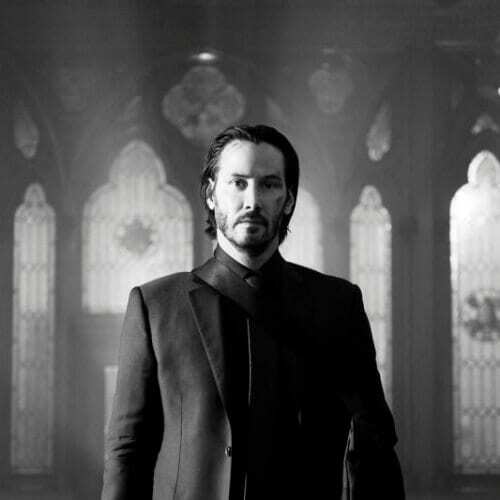 Not just a detective but a supernatural detective this time, Keanu tries to fight demons in this movie. But what should your hair look like in this bravest of endeavors? A layered comb over that lets everyone know you are the good guy. He didn’t get the girl in the end in Something’s Gotta Give, but one thing’s for sure. He had the best hair. 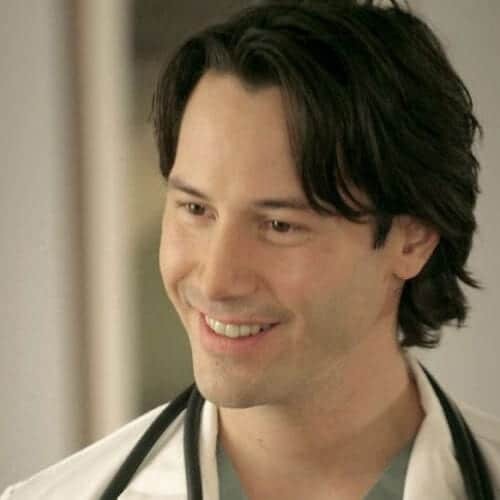 Keanu played a very handsome doctor with a medium layered haircut. It’s what we now call the iconic romantic comedy haircut. 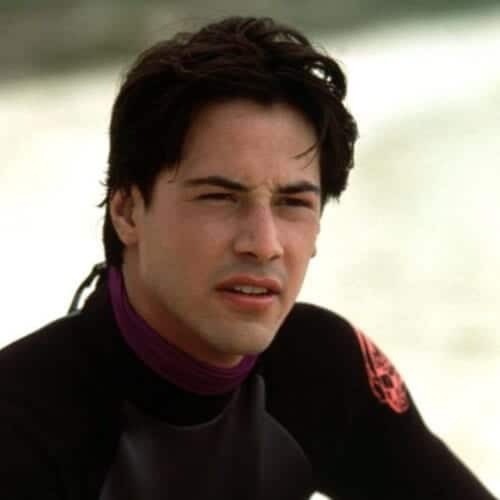 The Matrix is, without a doubt, Keanu’s most famous movie. 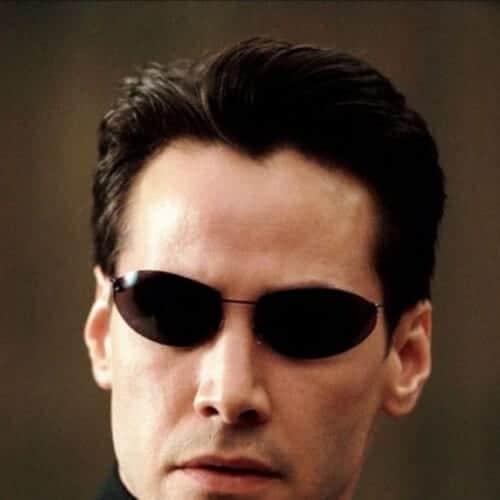 His look as Neo with the long, black coat, special sunglasses, and the short haircut is now one of the most recognizable in all movie history. 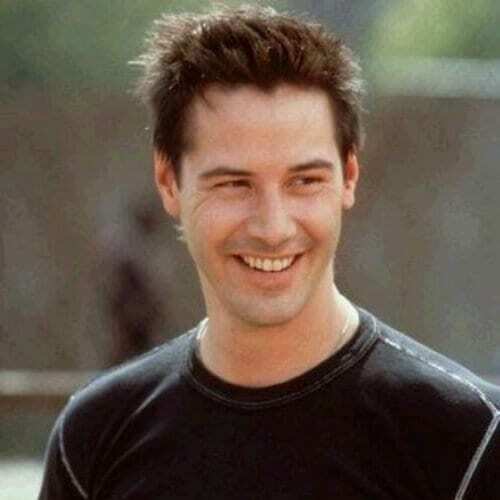 Keanu did a number of romantic movies throughout his career. All of them were successful, proving that he is equally able to portray a tough guy as he is to play a soft, starry-eyed male lead. In Sweet November he learns to love and loose from his co-star Charlize Theron. Keanu teamed up with Charlize Theron once again for the highly acclaimed by both fans and critics The Devil’s Advocate. He plays an attorney that loses sight of what’s right and gets corrupted by powers beyond his kin, all the while looking like a gorgeous Ken doll with perfect slicked hair. Although his performance in this Francis Ford Coppola flick was not much appreciated, his look was spot on. 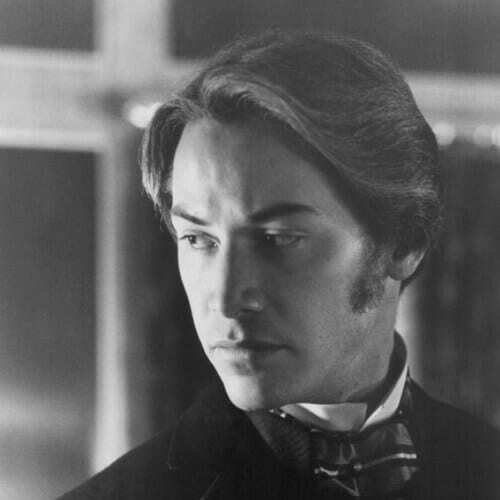 Keanu embodied Jonathan Harker with a 19th century wavy haircut and a set of medium mutton chops to match. Another romantic movie he was highly acclaimed for was this early 90s film in which he plays a soldier just returning from World War II and falling desperately in love with a beautiful woman. His hair represented that time era with a side part and lots of hair gel to keep it in place. 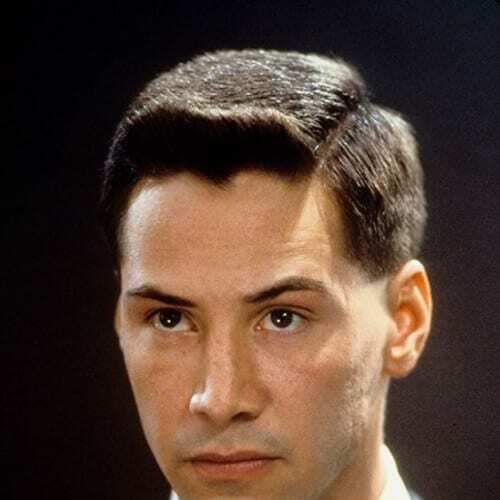 This is a feathery haircut with another side part and a glossy finish that Keanu wore in the movie Johnny Mnemonic. His bangs were upturned at the front creating a little wall of spikes which you can recreate with some hair wax. Keanu plays Siddhartha or Buddha in this 1993 film which also starred singer Chris Isaack. His hairstyle can be described as long hair with dark curls, as his character tries to tell the world the story of Prince Siddhartha. 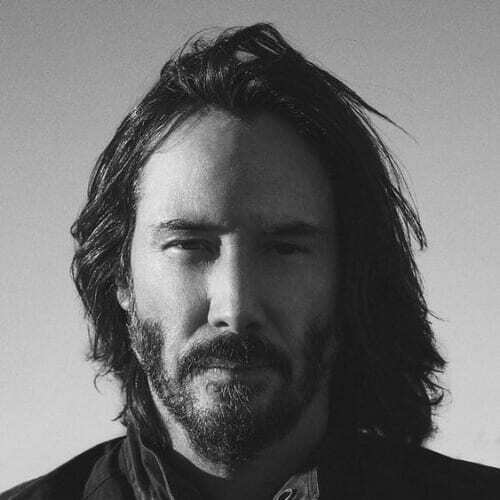 From Tibet to England, from Buddha to Shakespeare, there is nothing that Keanu Reeves has not tried in his career. This movie was directed and adapted by Kenneth Branagh and stars Keanu as Don Jon with beautiful sleek hair and a gorgeous beard. 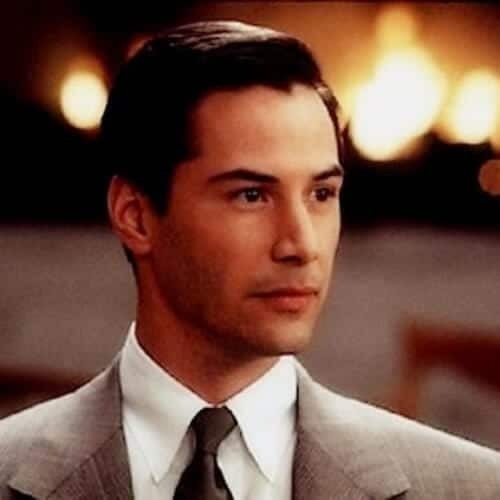 Speed was definitely one of Keanu’s most famous roles after The Matrix and John Wick. He sported a simple buzz cut, as he was just a man trying to stop a bus from exploding. Therefore, he needed to be able to spring into action at a moment’s notice. Speaking about his more famous movies, we simply cannot go through this list without mentioning Point Break. 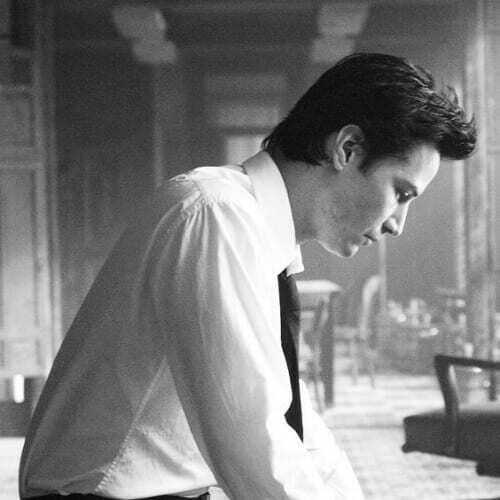 It defined Keanu’s career and made him the actor that he is today. Plus, it gave fans the world over as many chances as possible to see him sport the wet hair look. Is there anything that this man cannot pull off? He even looks good with an 18th century French hairstyle with long curls, rolls, and a ribbon as Chevalier Danceny. 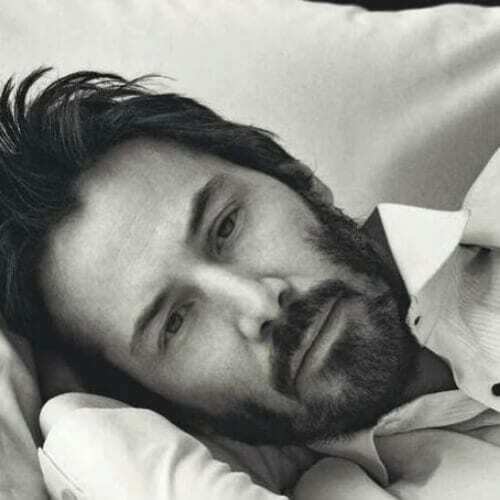 If this doesn’t prove that Keanu is one of the most handsome men in the world, then we don’t know what will. Here is an uncommon hairstyle even for Keanu, who has tried so many throughout his career. One side is cut short while the other is his usual medium shaggy haircut. He also has a set of wispy baby bangs to accompany this nontraditional hairstyle. Here’s a throwback to an 80s haircut if we’ve ever seen one. 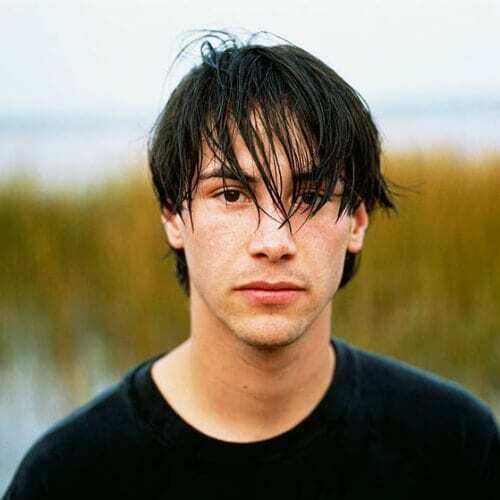 Keanu sports a shaggy jaw-length haircut with a part down the middle that compliments his teenager features. The haircut is also layered for extra volume and body. This was one of the first very successful movies Keanu was in. It started the teenage stage of his career, not to mention that it received so much positive feedback from fans that it spawned a sequel. In fact, at the end of the 2010s, Keanu announced he was thinking of making a part three of Bill and Ted’s Excellent Adventure. This is one of the more creative haircuts he ever wore, in a cinematographic sense. In this fantastic comedy movie, he plays Marlon, a very incompetent killer hired by an angry and cheated upon wife to strike out her husband, a pizza maker. Here is proof that fashion and styling trends are, indeed, cyclical. 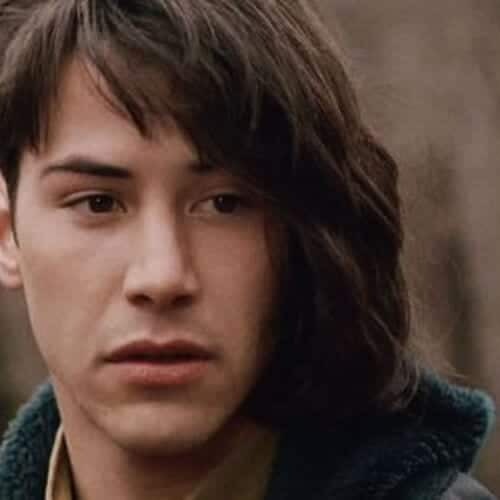 This movie appeared in 1989 but we’re sure that you can see the haircut Keanu is wearing in the streets today. This can only mean that we’re living a revival of those times. 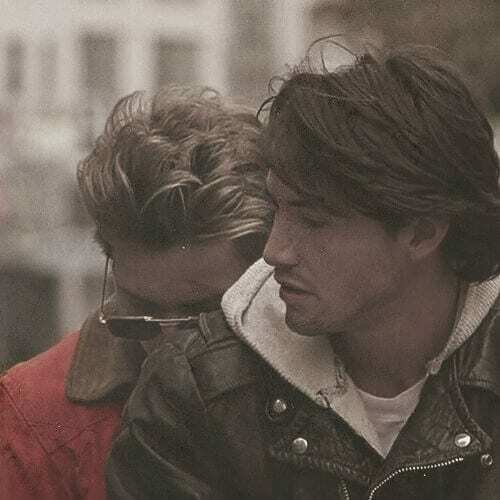 Undeniably one of the best movies Keanu Reeves has ever been in, My Own Private Idaho tells the story of two boys living on the streets and hustling but embarking on a journey of finding themselves that takes them all the way to Italy. The iconic imagery brought together a very young Keanu Reeves with the emblematic River Pheonix whom you can see behind him here. 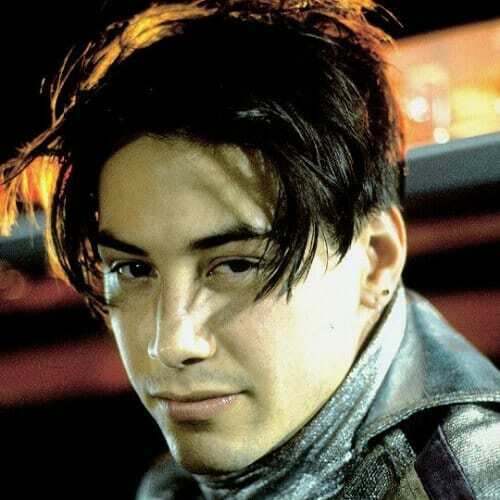 After scrolling through this extensive list of Keanu Reeves hair designs, one thing is certain. If you decide to make Keanu your styling guru, there will be no shortage of ideas. 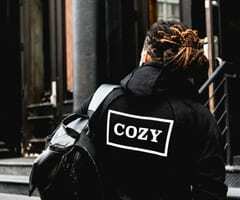 Throughout his career, he went from shaggy haircuts to 40s side parts to slick backs and buzz cuts without losing his rugged handsomeness for one second. 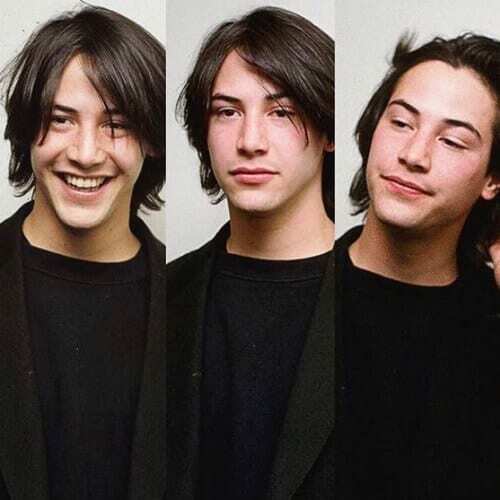 Let us know in the comment section below what is your favorite Keanu Reeves look!